The U.S. Pipeline and Hazardous Materials Safety Administration (PHMSA) recently announced increases in the maximum and minimum civil penalties for knowing violations of the federal hazardous materials transportation law or a regulation, order, special permit, or approval issued under that law. The penalty increases took effect last month. U.S. PHMSA officials said the penalty increases were called for by the Federal Civil Penalties Inflation Adjustment Act Improvements Act of 2015, which amended the Federal Civil Penalties Inflation Adjustment Act of 1990. Agencies were required to update their civil monetary penalties in August 2016 through an interim final rulemaking. PHMSA has elected to do the 2017 update in a final rulemaking. The rulemaking revises the maximum civil penalty from $77,114 to $78,376 for a person who knowingly violates the federal hazardous materials transportation law or a regulation, order, special permit, or approval issued under that law. The maximum civil penalty increases from $179,933 to $182,877 for a person who knowingly violates the federal hazardous material transportation law or a regulation, order, special permit, or approval issued under that law that results in death, serious illness, or severe injury to any person or substantial destruction of property. For violations related to training, the minimum penalty amount increases from $463 to $471. U.S. EPA Region 7 is planning a performance-based in situ thermal remediation (ISTR) requirement at the Cleburn Street Well OU2 Superfund Site in Grand Island, Nebraska. This is a revised version of the requirement originally posted for proposals by the U.S. Army Corp of Engineers under Solicitation MATOCS-16-R-H031. The Contractor shall provide the labor, equipment, materials, tools and supplies to design, install, construct, operate, control, and monitor all required elements of an in ISTR system to address soil contamination detected at and below the water table across a thermal treatment zone of approximately 12,700 square feet. The contaminants of concern are tetrachloroethene (PCE), trichloroethene (TCE), carbon tetrachloride (CCl4) and chloroform (CHCl3). The Contractor shall also be responsible for preparing the site for system installation (e.g., system location, power requirements, utilities, trenching, compaction, etc.) and shall identify existing PVC wells or piping affected by the ISTR process and recommend for abandonment. Additionally, the Contractor shall provide installation of eight groundwater monitoring wells and perform site restoration activities associated with the ISTR system (e.g., restore/replace all site features affected by construction operations, replacement of pavement and sidewalks damaged during construction and operations). Performance will take place over a 12-month period. THIS REQUIREMENT WILL BE A TOTAL SMALL BUSINESS SET-ASIDE. Interested parties are recommended to monitor FedConnect for updates to this presolicitation notice. The FedConnect posting is at https://www.fedconnect.net/FedConnect/?doc=SOL-R7-17-00008&agency=EPA [Note: It might be necessary to copy/paste the URL into your browser for direct access]. SPONSOR: Environmental Protection Agency, Office of Acquisition Management, Region VII, Lenexa, KS. 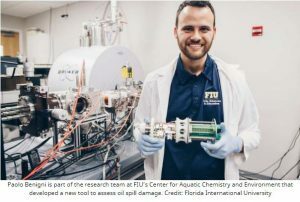 As reported in Physics.org, scientists are getting an entirely new perspective of what happens to oil in a spill, thanks to a tool developed by researchers at Florida International University. Little is known about the chemical make-up of oil and how it acts when it mixes with seawater or sunlight during a spill. But by combining techniques to create one powerful instrument, a team from FIU’s Center for Aquatic Chemistry and Environment can see how the oil behaves at the molecular level. The new tool could change how oil spills are cleaned up in the future since officials will have more and better information. According to the researchers, officials would be able to predict toxicity of spilled oil, how far it might travel and how long it would likely stay in the environment. “By dissecting crude oil composition down to their molecular level, we can better understand how it interacts with the environment, leading to better oil spill remediation strategies and more efficient environmental policies,” said chemist Francisco Fernandez-Lima, director of the project. Traditional analytical technologies have mainly restricted scientists to information related to the mass of crude oils. The new tool combines techniques, allowing scientists to simultaneously examine crude oil molecules by mass, size and shape without the need of lengthy sample preparation and separation steps. One of the techniques—trapped ion mobility spectrometry (TIMS)—was developed by Fernandez-Lima in collaboration with Bruker Daltonics Inc. Fernandez-Lima has been pioneering the use of the coupled technique for a variety of environmental and biomedical applications since 2010. By combining techniques, the researchers have developed a new analytical tool that can be used for more than just oil spills. Scientists can use it to study other contaminants in diverse water and land environments. With oil accounting for a large percentage of the world’s energy consumption, accidents with drilling, production and transportation are always a possibility. Improved remediation techniques are always the goal. Funded by the United States National Institutes of Health and the National Science Foundation, the researchers’ findings were recently published in Environmental Science & Technology. Preliminary findings related to this study were published in Analytical Chemistry and Journal of Visualized Experiments. In a previous article, I offered less than fulsome praise of U.S. EPA Administrator Scott Pruitt’s announcement that he was taking control of remedial decisions for big Superfund sites. Now, he’s followed up with a memorandum announcing establishment of a task force to look at ways to reform Superfund implementation. While he’s still plainly wrong in putting Superfund “at the center of the agency’s core mission,” I have to confess that I think he otherwise has pretty much hit a home run with the latest memorandum. Let’s start with the basics. Superfund is a mess. It’s one of the most poorly written statutes in Congressional history, and Superfund cleanups take way too long, are way too expensive, and fail to deliver bang for the buck in either risk reduction or productive reuse. In a perfect world, Superfund would be amended to privatize cleanups and put cost-effective risk-based cleanups at the center of the program. However, Scott Pruitt cannot unilaterally amend Superfund. Heck, he may not realize it, but even Donald Trump cannot unilaterally amend Superfund. 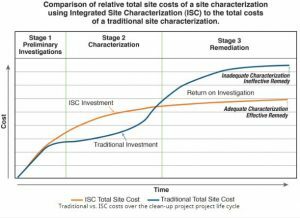 Reduce the administrative and overhead costs and burdens borne by parties remediating contaminated sites, including a reexamination of the level of agency oversight necessary. The last is my personal favorite. I somehow expect I’m not going to be praising this administration on a regular basis, but I can still acknowledge when they get something right. Let’s just hope that the task force is for real and comes up with a set of meaningful administrative improvements. Seth Jaffe is recognized b y Chambers USA, The Best Lawyers in America and Massachusetts Super Lawyers as a leading practitioner in environmental compliance and related litigation. He is one of the authors of the Law and the Environment Blog, www.lawandenvironment.com, which provides real-world perspectives on current developments in environmental law and regulation. Seth recently completed his term as the President of the American College of Environmental Lawyers. Seth works on a wide range of environmental law issues, representing clients in the permitting/licensing of new facilities and offering ongoing guidance on permitting and enforcement related matters under U.S. federal and state Clean Air Acts, Clean Water Acts, RCRA, and TSCA. He also advises on wetlands and waterways regulation. Seth’s clients include electric generating facilities, companies in the printing and chemical industries, and education and health care institutions. This article was first published on the website of Foley Hoag LLP. Every morning, I start my day by scouring the news to catch up on issues affecting the robotics industry. It seems that there isn’t a day that goes by without a major publication either extolling the virtues of robotics or lamenting with doomsday predictions of robots taking over. Irrespective of one’s point of view, the notion of advanced machines capable of performing dangerous and difficult tasks has taken center stage. In my view, we are entering the golden age of robotics, where technological innovations coupled with substantially reduced component costs allow us to deploy robots that can reliably and cost effectively augment human performance to keep human’s out of harm’s way. This is particularly relevant and timely for the first responder community, where the physical and emotional toll on both first responders and the communities that they serve, can be substantially mitigated by providing first responders with enhanced situational awareness without requiring their physical presence. The worldwide market for law enforcement robots will be approximately $5.7 billion by 2022, up from $1 billion in 2015, according to Wintergreen Research estimates. That’s a pretty significant increase. While robots have been used in law enforcement for years, primarily for bomb disposal, and to a lesser extent for SWAT and other tactical scenarios, hazardous materials (HAZMAT) professionals have been slow to adopt robotic solutions in part because most robots haven’t been designed to address the unique needs of the HAZMAT community…until now. For HAZMAT professionals, small, man-portable robots can provide important assistance with collecting and analyzing information about hazardous environments well before a response team is suited up to evaluate the scene. These robots can use on-board sensors to conduct tests and relay information back to both the on-site response team as well as off-site experts. This valuable data can expedite the formulation and execution of a response plan and can reduce the amount of time HAZMAT professionals need to be exposed to dangerous environments. In some cases, the deployment of robots, such as Sarcos’ Guardian S mobile IoT platform, could be the difference between life and death. Why now? According to analyst firm IDC, “technological development in artificial intelligence, computer vision, navigation, MEMS sensor, and semiconductor technologies continue to drive innovation in the capability, performance, autonomy, ease of use, and cost-effectiveness of industrial and service robots,” said Jing Bing Zhang, research director of worldwide robotics at IDC Asia/Pacific. Robots that can perform a variety of observation and data collection functions in HAZMAT scenarios make it an economically viable and safer solution for HAZMAT professionals. For those who fear that robots will take over and replace human jobs, many robots, including Sarcos,’ are exclusively tele-operated, meaning that they rely on human intelligence, not artificial intelligence, to complete the mission. Artificial intelligence is an exciting and promising technology that will become increasingly useful as time goes on. However, as with all things “artificial,” such as artificial sweeteners or artificial light, the artificial version isn’t always a direct substitute, it sometimes lacks the same characteristics or performance as the natural version. As a team, Sarcos fundamentally believes that when it comes to life and death decision-making in unstructured environments, there is no substitute for the wisdom and judgment of humans. Most HAZMAT scenarios require a minimum of four people to be suited up on a scene, two to assess a situation and two on standby to sub in for the others if an incident occurs. These teams are often part of a larger 20-person operation. With the use of portable, tele-operated robots equipped with sensors, critical chemical and environmental data along with real-time video can be obtained from the scene without the need for a person to be physically exposed to the hazardous conditions. Robots can do a variety of assessments, such as testing for chemical compounds or detecting radiation, and transmit the data back to the operators and other off-site experts. This provides the HAZMAT crew with initial information before they suit up and enter the area, which ultimately enables the team to be better prepared and ultimately more efficient — saving precious time in the most dangerous situations. Some robots can carry a variety of advanced sensor arrays that can be customized according to the needs of the customer. Some of these sensors include high definition video cameras, high definition still cameras, IR video cameras, stereo cameras, radiation detectors, gas detectors and a variety of non-destructive testing sensors. Additionally, some can use a wide-range of connectivity solutions, including Wi-Fi, private long-range radios and LTE cellular networks. Given the nature of hazardous gases, it is important for robots to be enabled to scale certain vertical surfaces, allowing the robot to take readings from different elevations. The versatility of sensors and connectivity options enables HAZMAT crews to customize their robots according to their unique mission requirements. One significant barrier to adoption for many first responders is the relatively high historical total cost of ownership of robotics platforms. To address this hurdle, Sarcos, and an increasing number of other robotics companies, offer a Robot-as-a-Service (RaaS) option, which requires no upfront hardware costs for the basic robotic platform, provides ongoing maintenance, support and training, and allows a customer to upgrade at the end of the contract term. Analyst firm IDC predicted that by 2019, 30 percent of commercial service robotic applications will be in the form of a “Robot as a Service” business model. For various public safety agencies including HAZMAT divisions, lower upfront costs combined with ongoing training and support from the manufacturer, will make deployment of robots more viable. We are at the dawn of the Golden Age of robotics. More than simply the automation of dull and boring tasks to improve efficiencies, we expect to see explosive growth and adoption over the next decade of human-controlled robotic systems that are capable of performing meaningful work in unstructured environments. And while there is much hype about robots replacing human workers, when robots are designed and deployed that augment rather than replace human performance, everyone benefits. This is especially true for HAZMAT professionals and other first responders, who put their lives on the line every day for the benefit of the communities they serve. One day soon, the deployment of tele-operated robots will be standard protocol and we will have truly succeeded in helping our first responders get their jobs done more effectively while reducing their personal risk of injury and death. Benjamin Wolff serves as the Chairman & CEO of Sarcos Robotics, a leading global robotics and sensor company. In this role since 2015, Wolff oversees the strategic direction of the company and engages with some the company’s strategic partners, customers and investors. Prior to joining Sarcos, Wolff served as Chief Executive Officer, President and Chairman at Pendrell Corporation (NASDAQ: PCO) from 2009 to 2014. Before earning his law degree from Northwestern School of Law, Lewis & Clark College in Portland, Oregon in 1994, Wolff earned his Bachelor of Science degree from California Polytechnic State University in 1991. Green Ocean, a Dutch based company, recently announced it has developed a 100% environmentally friendly oil abso rbent made of volcanic basalt rock. The company claims that the technology shows unbelievably results in cleaning oil spills. Green Ocean claims its products absorb oil three times faster and can adsorb three times more oil than any existing solution on the market. In addition, the company states that its absorbents are fully recyclable, because oil can be easily wrung out of the absorbent, dramatically saving costs on disposal. One gram of GO filler can absorb up to 72 grams of oil. Absorbent boom of 20/3m can take 94 liters comparing to 44 liters of polypropylene boom of the same size. In May 2017, the company opened sales office in the USA. Green Ocean sees huge potential in US market, as North America holds the biggest part of World’s sales of oil cleanup technologies and always looks for more efficient solutions. Green Ocean already operates in Europe and Russia. st of the spills can be prevented, not just stopped. ” Says CEO of Green Ocean, Shai Granovski. Green Ocean headquarters is in Amsterdam, Netherlands, production plants are in Latvia and Russia. The U.S. EPA is hosting a webinar on exports and imports of hazardous wastes, including those managed as universal waste and spent lead-acid batteries, are required to follow import and export procedures under 40 CFR Part 262 Subpart H.
Shipments of hazardous waste that go first to an interim facility for temporary holding or consolidation prior to being shipped to a final disposal or recycling facility have special procedures to follow under U.S. law. The one-hour webinar will walk through the additional information to provide in U.S. EPA notices and the shipment-specific tracking procedures you must follow to comply with 40 CFR Part 262 Subpart H.
The webinar will take place on June 5th at 3 pm EDT. To register, visit the clu-in.org website. The U.S. Interstate Technology and Regulatory Council (ITRC) and the U.S. EPA are hosting a webinar on integrated site characterization of sites contaminated with dense non-aqueous phase liquids (DNAPLs). The webinar is scheduled for June 8th. To register for the webinar, visit the IRTC website. Sites contaminated with dense nonaqueous phase liquids (DNAPLs) and DNAPL mixtures present significant environmental challenges. Despite the decades spent on characterizing and attempting to remediate DNAPL sites, substantial risk remains. Inadequate characterization of site geology as well as the distribution, characteristics, and behavior of contaminants — by relying on traditional monitoring well methods rather than more innovative and integrated approaches — has limited the success of many remediation efforts. As reported by Northern Ontario Business, an interactive map of national orphaned and abandoned mines has recently been released by the National Orphaned and Abandoned Mines Initiative (NAOMI). NOAMI was launched in 2002 in response to a request from mine ministers in federal, provincial and territorial jurisdictions to address issues related to orphaned and abandoned mines across the country. The NOAMI Advisory Committee consists of representatives of federal/provincial/territorial governments, the Canadian mining industry, environmental non-governmental organizations and Aboriginal peoples and their communities. The NOAMI Advisory Committee makes no representation and takes no responsibility that the information in the interactive map is accurate, current or complete. Class A: a site with potential to cause environmental, public health and public safety concerns. Class B: a site with limited potential to cause environmental concerns but with potential for public health and safety concerns. Class C: a site with public safety concerns but little or no public health or environmental concerns. Class O: a site with no expected environmental, public health or public safety concerns. Mine sites are additionally classified as active or inactive, neglected or terminated, and orphaned/abandoned, or as legacy sites. The inventory comprises information supplied by participating jurisdictions. Noticeably absent from the map is inventory of mines from B.C., Yukon and Québec, a point lamented byMiningWatch Canada, a not-for-profit organization that is a watch dog of the mining industry. The organization is supported by environmental, social justice, Indigenous and labour organisations from across the Canada. “We are pressing these governments to step up and join the rest of Canada in sharing their data,” said Ugo Lapointe, MiningWatch Canada’s program coordinator (Canada) and a member of NOAMI’s steering committee, in a release. MiningWatch Canada said, based on its estimate, the total cost for cleaning up these sites could be more than $9.1 billion, including $3.1 billion for Ontario, $2.4 billion for B.C., $1.9 billion for Québec and $1.7 billion in the northern territories. “Financial data are missing for central and Maritime provinces, which account for about a third of all mining production in Canada,” MiningWatch notes. Joan Kuyek, co-founder of MiningWatch and of NOAMI, and current chair of Ontarians for a Just and Accountable Mineral Strategy (OJAMS), noted the inventory has been a long time coming. “The inventory is not complete, nor perfect, but it includes most provinces and territories in Canada and is an important step to ensure greater transparency and inform the public about the location of contaminated mine sites which may pose a threat to the environment, public health, and public safety,” Kuyek said. As reported by NPR, The U.S. Department of Energy has declared an emergency at a nuclear-contaminated site in Washington state, after soil caved in over a portion of a tunnel containing rail cars contaminated with nuclear waste. “All personnel in the immediate area have been accounted for — they are safe — and there is no evidence of a radiological release,” Destry Henderson, spokesperson for the Hanford site’s emergency operations center, said in a brief statement on Facebook. Some employees were evacuated and others were told to move indoors as a “precaution,” officials say. Anna King of the Northwest News Network, a public radio station collaboration, reports that approximately 3,000 other workers in the area were originally taking cover indoors. Nonessential employees have since been sent home, and essential employees were instructed to avoid the site of the tunnel. 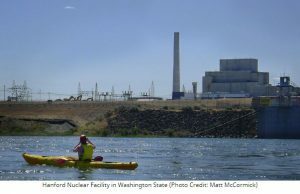 The Hanford Site, about 150 miles southeast of Seattle, is a former nuclear production complex and home to a long-running, challenging and sometimes troubled cleanup operation. It’s generally regarded as the most contaminated nuclear site in America. The Department of Energy says it’s the most challenging of the government’s nuclear cleanup projects, with millions of tons and hundreds of billions of gallons of nuclear waste. The Department of Energy says a 20-foot-by-20-foot section of soil caved in where two underground tunnels meet next to the Plutonium Uranium Extraction Facility, known as the PUREX plant. The cave-in was discovered during routine surveillance. The tunnels in question were storing rail cars that once carried radioactive nuclear fuel from reactors to production facilities, back when the site was still used to manufacture nuclear weapons. Each tunnel is hundreds of feet long, the Hanford Site says, made of wood and concrete and covered with about 8 feet of soil. A 20-foot-long section appears to have collapsed. “There is no indication of a release of contamination at this point,” the Department of Energy says. 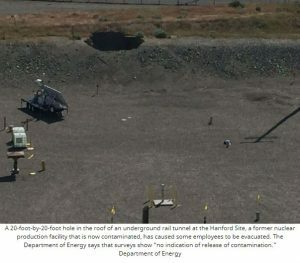 “In 2015, a preliminary report identified the tunnels and the PUREX facility as a major risk area on the Hanford site. The report concluded if the tunnels collapsed, from an earthquake or another natural cause, it could pose a risk to workers because of the highly contaminated railcars stored inside. The governor of Washington, Jay Inslee, says there are “many questions” about how the collapse happened, reports member station Oregon Public Broadcasting. “Hanford is the nation’s largest nuclear cleanup site, with 56 million gallons of radioactive waste sitting in old, leaky underground tanks just a few hours upriver from Portland. After more than 20 years and $19 billion[,] not a drop of waste has been treated. The treatment plant was originally supposed to be finished in 2007, but the deadline has been extended several times, OPB reports.